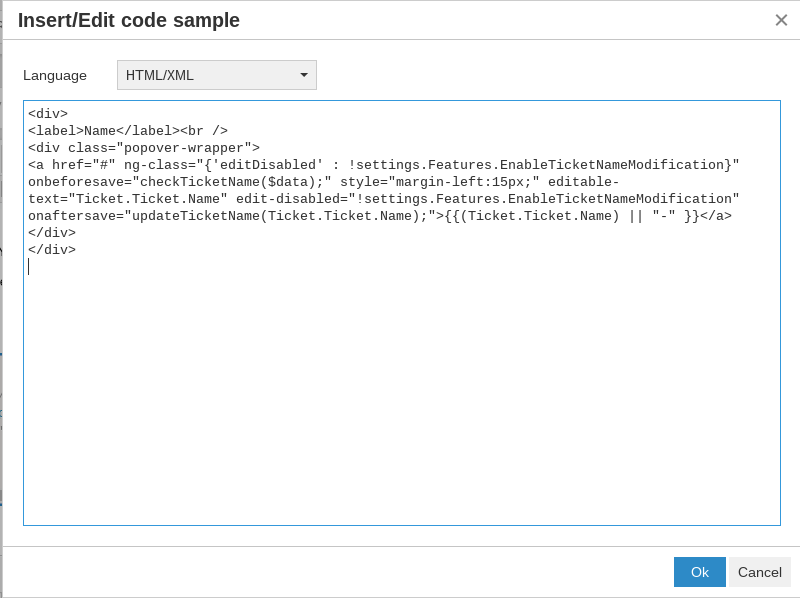 TeamSupport provides the “Insert/Edit Code Sample” button in the action editing toolbar which gives you the ability to share code samples within actions. If you choose not to use this button and paste code directly into the action window, you may get varying results. For example, your code my be processed by the editor and your formatting may not be retained. Choose the language of your sample code and paste the code into the provided window. When finished, click Ok. Your code will be placed in a separate box within the action. You will see that the tags will be highlighted in different colors which you can use to ensure the code was pasted properly. Once the code is inserted, if you would like to edit again, you must click inside this box so that the outline is of the box is highlighted, and click the “Insert/Edit Code Sample” button again.